See in Glossary together but allows the distance between them to change as though they were connected by a spring. See in Glossary is connected to. If no object is assigned then the spring will be connected to a fixed point in space. See in Glossary The point in the object’s local space at which the joint is attached. 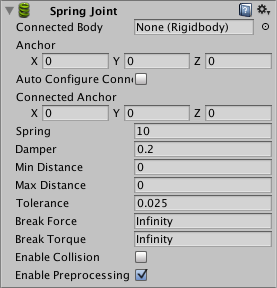 Auto Configure Connected Anchor Should Unity calculate the position of the connected anchor point automatically? Connected Anchor The point in the connected object’s local space at which the joint is attached. Spring Strength of the spring. Damper Amount that the spring is reduced when active. Min Distance Lower limit of the distance range over which the spring will not apply any force. Max Distance Upper limit of the distance range over which the spring will not apply any force. Tolerance Changes error tolerance. Allows the spring to have a different rest length. See in Glossary with each other? The spring acts like a piece of elastic that tries to pull the two anchor points together to the exact same position. The strength of the pull is proportional to the current distance between the points with the force per unit of distance set by the Spring property. To prevent the spring from oscillating endlessly you can set a Damper value that reduces the spring force in proportion to the relative speed between the two objects. The higher the value, the more quickly the oscillation will die down. You can set the anchor points manually but if you enable Auto Configure Connected Anchor, Unity will set the connected anchor so as to maintain the initial distance between them (ie, the distance you set in the scene view while positioning the objects). The Min Distance and Max Distance values allow you to set a distance range over which the spring will not apply any force. You could use this, for example, to allow the objects a small amount of independent movement but then pull them together when the distance between them gets too great.